During Fire Prevention Week , learn how you can make your home a safer place for you and your family. You can prevent home fires. An online video available through CDC-TV, "A Time to Act", explores one of the most common causes of unintentional injury deaths in the United States. In 2009, fire departments across the country responded to 377,000 home fires. These fires claimed the lives of 2,565 people and injured another 13,050. Approximately 4 out of 10 home fire deaths occur in homes without smoke alarms. The main reason smoke alarms fail to operate during home fires is missing or disconnected batteries. Your home should be a safe and comfortable place—and you can help keep it fire-safe by following these prevention tips. Cook with care. When you cook, never leave cooking food unattended on the stove. Keep anything that can catch on fire, like potholders and towels, away from the cooking area. Avoid wearing clothes with long, loose-fitting sleeves that can catch on fire. Also, keep pot handles turned in. If you smoke, attempt to quit. Don't smoke inside your home. If you do smoke in your home, never smoke in bed or leave burning cigarettes unattended. It is unsafe to smoke while drowsy or under the influence of alcohol or medications. Also, don't empty burning or hot ashes in a trash can, and keep ashtrays away from upholstered furniture and curtains. In an effort to raise parents' awareness about the leading causes of child injury—including burns— in the United States and how they can be prevented, CDC launched the "Protect the Ones You Love" initiative. Parents can play a life-saving role in protecting children from injuries. Information is available in English and Spanish. Learn more. Stay warm—safely. If and when you use a space heater, keep it more than three feet away from anything that can catch on fire, like draperies. sleeping rooms, especially if they are occupied by a smoker. Test all smoke alarms once a month using the test button. with everyone living in your home. For more tips on protecting children from burns, visit CDC's Protect the Ones You Love. An online video available through CDC-TV, "A Time to Act", chronicles the experience of a family that escaped during a home fire after being alerted by recently installed smoke alarms. The video also reviews the main risk factors for home fires and steps viewers can take to reduce the risk of fire-related injury and death. These steps include installing and regularly testing smoke alarms and practicing a fire escape plan at least twice a year. 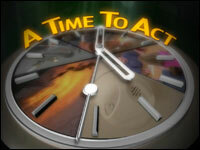 "A Time to Act" is available for viewing through a number of channels including mobile phone, or as a podcast, or for download (see "Download this Video" instructions on the CDC-TV page) thus allowing organizations to utilize our online video in any number of ways including as an instructional tool for parents, healthcare providers or teachers. Providing short, high-quality videos is part of CDC's goal to increase people's access to the information necessary to help prevent illness, injury and to protect their health and that of their families.